PHOTO BY JACOB GURNEY Fostoria Fire Division personnel work at the scene of a house fire at 429 Sandusky St. Friday evening. 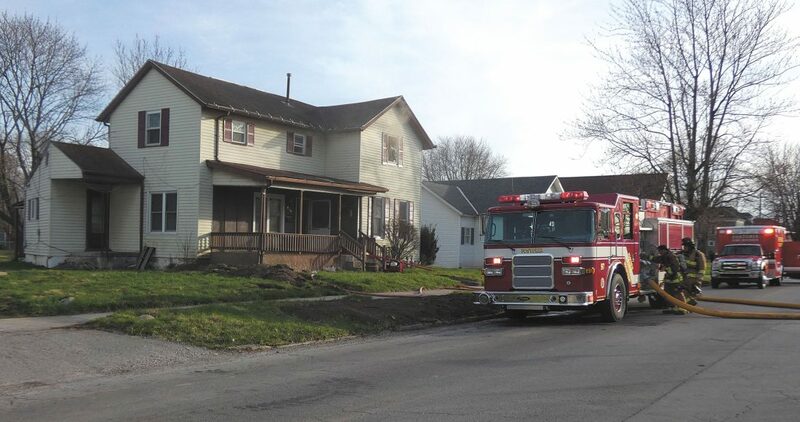 FOSTORIA — Residents were displaced after a house fire at 429 Sandusky St. Friday evening. Chief Brian Herbert of Fostoria Fire Division said five people lived in the downstairs and one person lived upstairs. He said the downstairs residents notified the upstairs resident to the fire and everyone was able to get out of the house. Herbert said the American Red Cross was contacted and he did not know where the residents were staying Friday night. Nobody was injured in the fire, he said. When crews arrived at the scene, light smoke was coming from the building, he said. Herbert said personnel made entry and found a fire around a dryer on the first floor. The fire got into the wall, went straight upstairs into the ceiling and ended up toward the attic, he said. After crews initially took the water line in the front door to put out the fire, they then had to go back outside to go up to the upstairs because it is a duplex, Herbert said. Captain Jerry Goodman of Fostoria Fire Division said it took crews about half an hour to get most of the fire put out and personnel were at the scene for about another hour and a half completing overhaul and investigating. The property is owned by Chad and Tona Brickner, according to the Seneca County Auditor’s Office website. Goodman said the total loss estimate was about $20,000. Herbert said there was smoke and water damage throughout the house. Goodman said the fire originated in the area of the dryer and the cause of the fire was ruled undetermined Friday night. American Electric Power was contacted and responded to the scene. Sandusky Street was closed while crews worked at the scene and a Seneca County Community Emergency Response Team responded to the scene for traffic control. The fire was reported at 6:11 p.m. and Fostoria Fire Division and Fostoria Police Department responded to the scene.